This season, modern luxe décor balances clean lines with organic elements, lots of texture and serene florals. Take your dessert display to new heights. 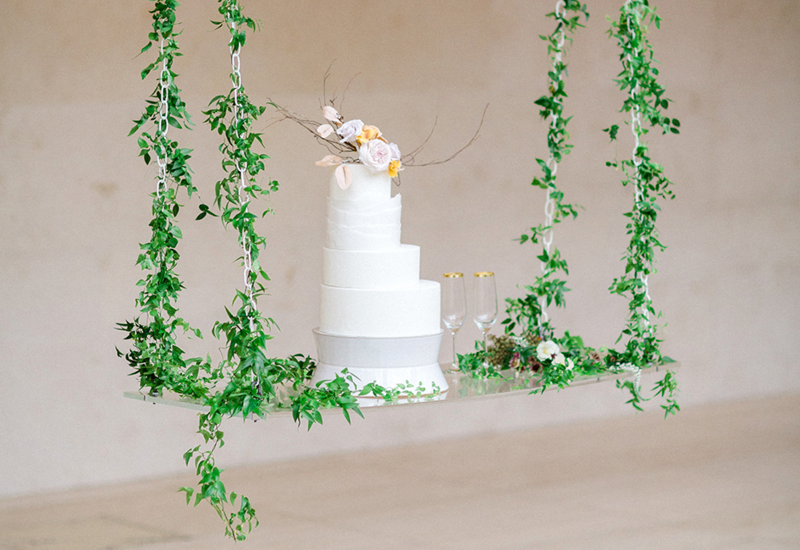 Here, Cherry Blossom Events creates a custom hanging cake table, adorned with a whimsical greenery installation by KP Designs. The centerpiece is a four-tier minimalist-chic creation by Curtis & Cake, featuring subtle texture and a topper of lush blooms. 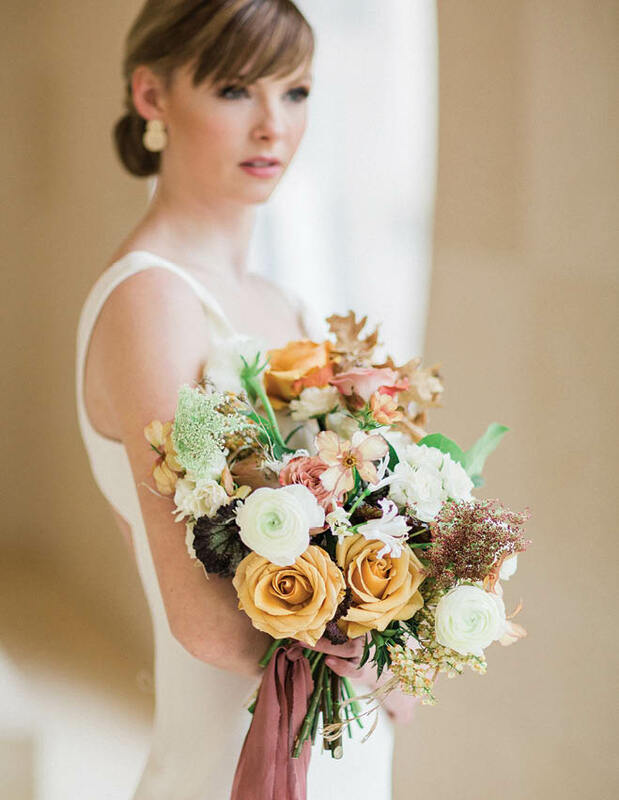 This bouquet by Pollen House takes its palette from a late-summer sunset, with butterscotch roses, creamy ranunculus and a gauzy rust ribbon. Set a head table that will turn heads. 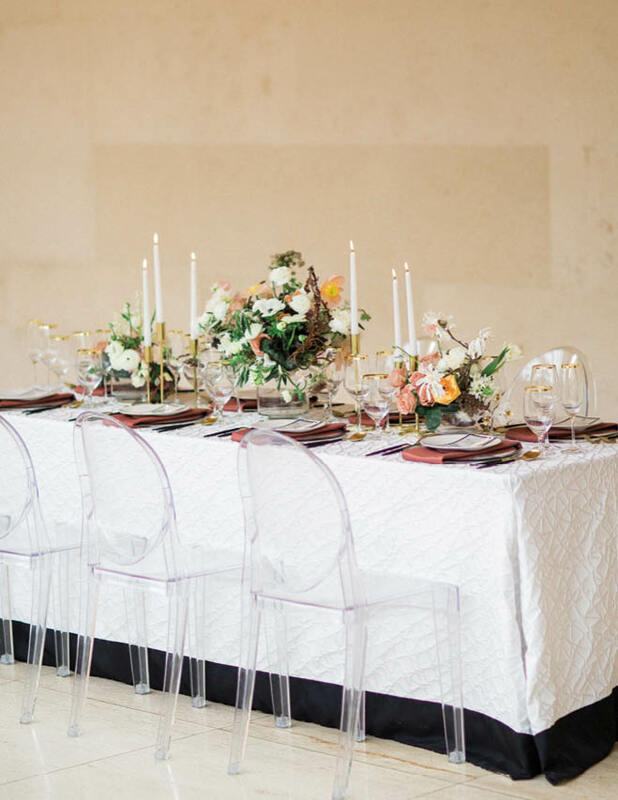 Here, acrylic ghost chairs from Arena Americas tuck into a meticulous table. A tailored cream cover from BBJ Linen is edged with sophisticated black band, smartly complementing the groom’s tuxedo (opposite), black-edged stationery, charger plate and flatware. The setting is crowned with gorgeous centerpieces from daffodil*parker, featuring petals in shades of apricot, rose and ivory. 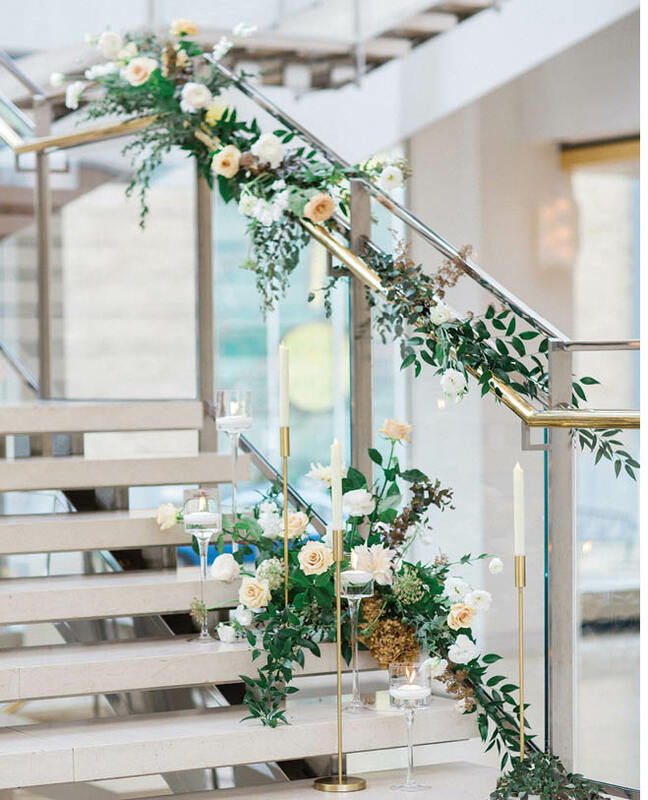 How divine to say your “I do’s” on the grand staircase of the Overture Center for the Arts. A lavish floral installation by Alluring Blooms elevates the scene to dream-worthy status. Guests will love to take a seat at this table. 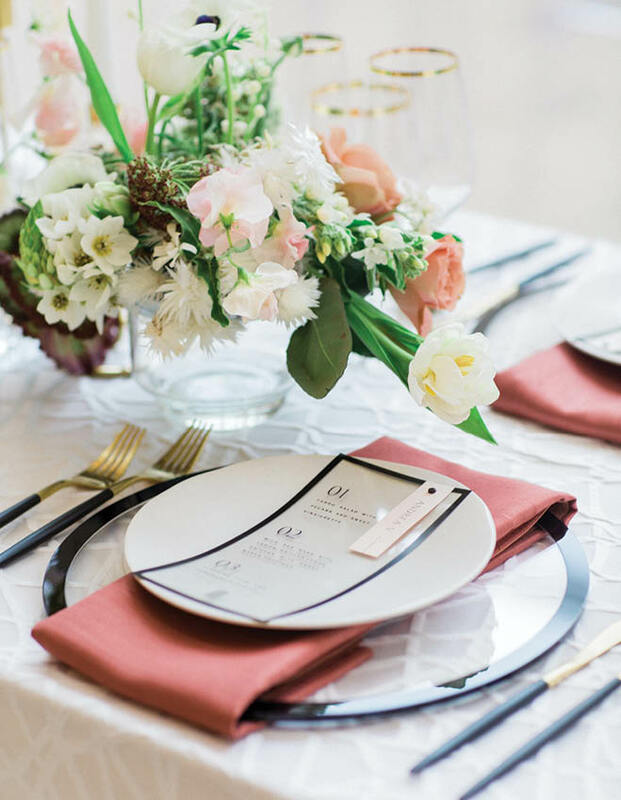 Set with dusty rose napkins from BBJ Linen, plateware and glassware from Event Essentials, custom chargers by Cherry Blossom Events and a Saffron Avenue menu card, the place setting exudes a refined modern aesthetic. The bride isn’t the only one in white. 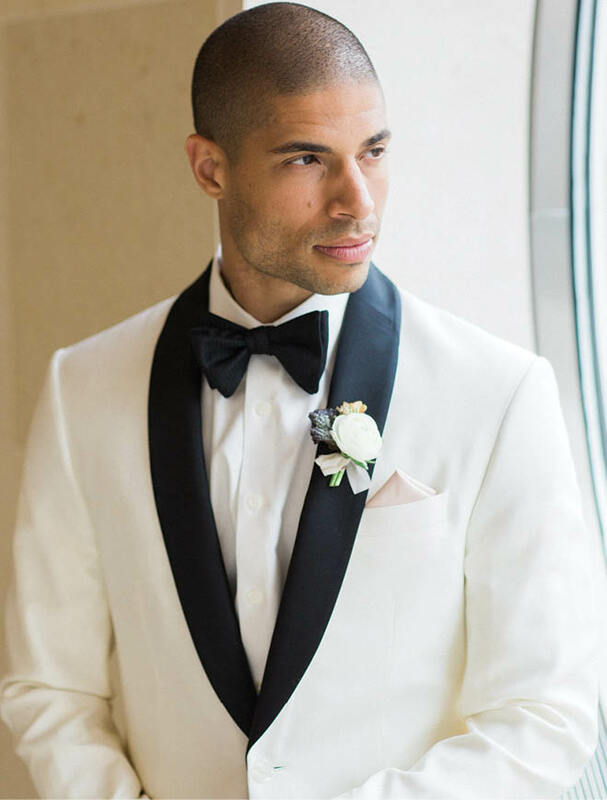 The groom wears a classic cream tuxedo dinner jacket with shawl lapel from The Black Tux, accented by a sweet and petite boutonniere from Pollen House. 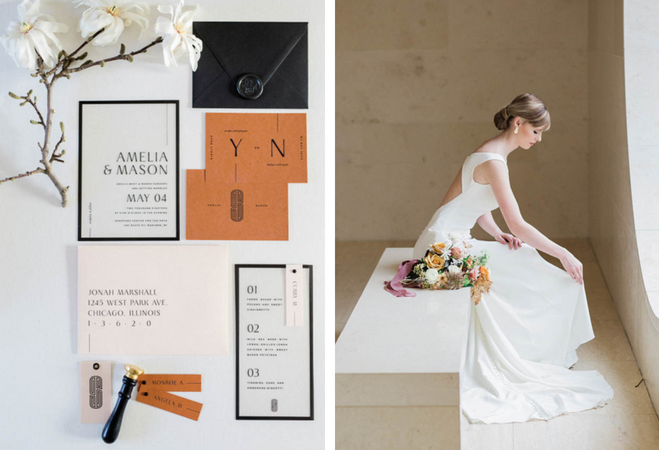 This invitation suite from Saffron Avenue gives guests a peek at the contemporary celebration to come: clean lines and modern design are paired with a black border, and rust-tinted reply cards mirror the color of the head-table napkins. When you wed in an architectural gem like the Overture Center, photo ops are everywhere. This is a perfect spot for a bridal portrait: Our bride is resplendent in a sleek gown from Brandi’s Bridal Galleria, Etc.